Over-nighting in Arica, and with the knowledge we had gained from our fellow adventurers we left the following morning for the border post, cleared customs and entered Peru. More documentation than expected, nine official stamps in all – police, aduana, gate-clearance etc. We had no idea what they were all for. 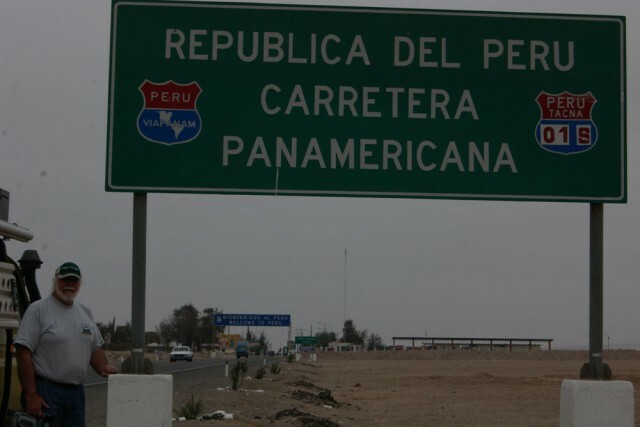 After entering Peru we pointed the Troopie north-east leaving the coast behind arriving in Tacna , went to a money exchange and cashed some money. Got taken to the tune of $30 by the Cambio -fools we are!!!! However once bitten twice shy!!! Will check in future – our fault. Leaving Tacna ever north on the Panamericana we were immediately confronted with the desert. However, here airplants growing in this barren land, identical to the non-indigenous ones hanging from driftwood and walls at home the only difference back there is that they are watered, fed Seagrow and molycoddled but in the desert in this inhospitable terrain, the only nourishment is filter feed from the air – survival at its best. Driving along as we ventured farther on in the desert even these plants ceased to exist and stretching from horizon to horizon, miles and miles of sand, grit and stone and way over to the east the occasional sight of the snow-capped Andes, to the west in the slowly setting blinding sun, only haze. From there the road paralleled the coastline approx 40 kms inland. It steadily and almost unnoticeably climbed – the only inkling we had of this incline was the Toyota Land Cruiser running in 4th gear – not enough torque to engage top gear – too heavy. 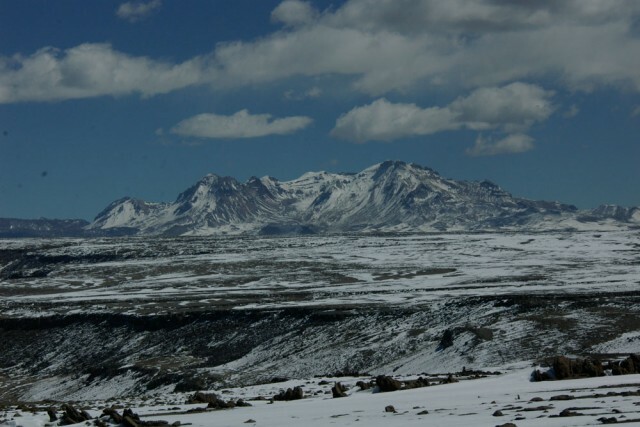 Ever so often we would descend from this high plateau into extremely deep canyons gouged out of the dry earth over the eons by water filtering from snow melting on the high Andes and draining into the Pacific. So it was late Thursday afternoon we rolled out of these desolate surroundings and realized that we were surrounded by huge mountains not visible in the haze but becoming more distinct as we descended towards Moquecua , one of the driest towns of Peru where the Peruvian coastal desert reaches its driest point and emerges into the Atacama desert of northern Chile, the driest in the world. In spite of this the town is situated along a narrow green belt. The farm lands along this meandering river are watered by ingeniously laid out canal systems and flood irrigated. These lush fields and pastures are no more than a football field wide either side of the river. It is hard to imagine that agriculture could be possible in this harsh terrain, the river providing the only moisture to these terraced, walled fields and lands. Primitive farming, however extremely efficient. No inch of arable land wasted. Livestock are tethered with long leashes along the edge of lucerne fields and graze only that which is within reach – clever! Don’t take the fodder to the animal, tie the beast to the feedlot. Most interesting and educational. It is absolutely amazing, we have been here almost five months and it has been a roller coaster ride of incredibly vast and majestic scenery – up and down passes more than one could wish to count. So here we leave Moquecua and the Panamericana taking us towards Arequipa – altitude 2,325 m situated in the mountainous desert of the western Andes, a city of the highlands, the second largest in Peru. It is surrounded by spectacular mountains, the most famous Volcan Mitsi 5,822 m which has a beautiful conical snow-capped peak. It rises dramatically above the city and to the north the more rugged and higher Chachani 6,075 m and the lower peak of Pichu Pichu 5570m. Most of the buildings date back to the 16th Century of Colonial times and are built of light coloured volcanic rock. The city is also very prone to earthquakes and if my memory serves me right the last took place two years ago. No sooner had we hit town we realized there were three methods of public transport – the Municipal 35 seater, the 12 seater Hi-Ace typical of South Africa and then literally hundreds of Mini size Daewoo Taxis with lollipop signs on top, in a host of colours, careering through the narrow streets like a gaggle of go-carts or dodgems. Too cute for words!!! We drove towards the city centre in chaotic traffic on Friday afternoon. No problema!! 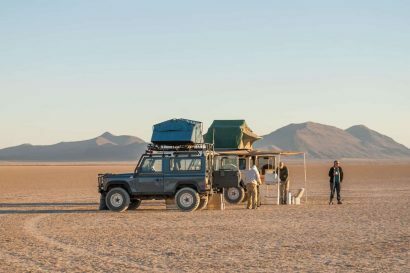 With the Troopie’s size and massive bull-bar it was easy to weave our way along the narrow streets, had no idea where we were – generally we try to aim in the direction of the cathedral spires or towers normally visible from any point of a city or town. So it proved correct. Close to the main plaza we crossed a river and found a cosy hotel overlooking the city centre near enough to walk for our daily exercise. Many times en route to Arequipa, at numerous check points, the Policia, enquired whether we were coming to watch “Futbol”. At the time we did not comprehend the question but when we checked into the hotel we soon realised that two legs of the “Copa America” were being played in Arequipa and the Chilean team was resident in our hotel. There was security to the Nth degree. Spent the week-end strolling and sight seeing in this most historical colonial city with its magnificent cathedral and ornate buildings situated around Plaza de Armas and its numerous interesting streets. The weather at this time of the year brings blue skies, windless days and icy cold nights. 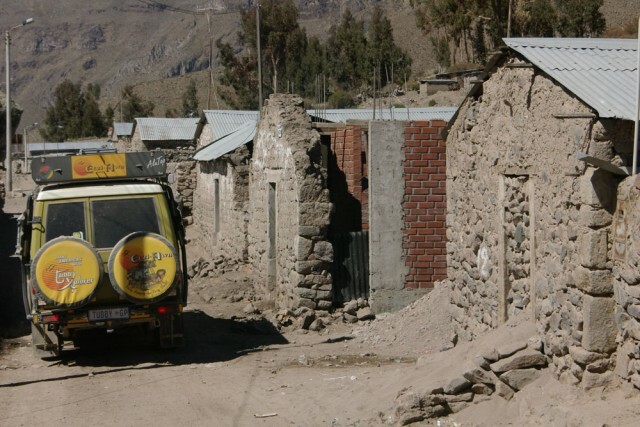 Monday morning the 12th July we left Arequipa, our destination the Colca Canyon supposedly the deepest in the world. Controversy rages at time of writing – the opinion is that the nearby Canyon del Cotahuasi may in fact be deeper. What does it matter? In my mind this is irrelevant but to the fundis (experts) I suppose it is of importance. The question is arguably from which point does one take such a measurement. Alas!! No sooner had we left the hotel and city the road started its inevitable climb leaving Arequipa behind and almost 120 kms of slow ascent reached the highest altitude of our trip to date 4800m Tubby’s engine clattering for the lack of air. Should have fitted an altitude compensator. Not knowing the terrain we were going to travel – when the subject was broached Stuart Baillie and I decided that it was not necessary. However with hindsight this should have been done. To compensate for not having one I nurse the vehicle towards these dizzy heights, never over revving the engine and change oil and filter more often, i.e. 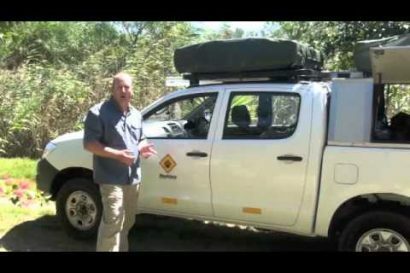 every 2,500 kms rather safe than sorry until we reach lower altitudes in 2-3 months time. High up here on the Altiplano there were many small families of vicunas, herds of alpaca and llama. To date we have seen all four of the camelid species found in South America. The vicuna, the smallest of this species at approx 1m at shoulder height and the most sought after for its high quality wool. The taller, more rough looking guanaco seen down south in Patagonia is virtually wiped out here in the north and then the even larger and woollier alpaca and lastly the largest of them all the llama. At the summit the air is thin. Margaret and I had to “walk the walk” slowly, although reasonably acclimatized to high altitudes we still take it easy. 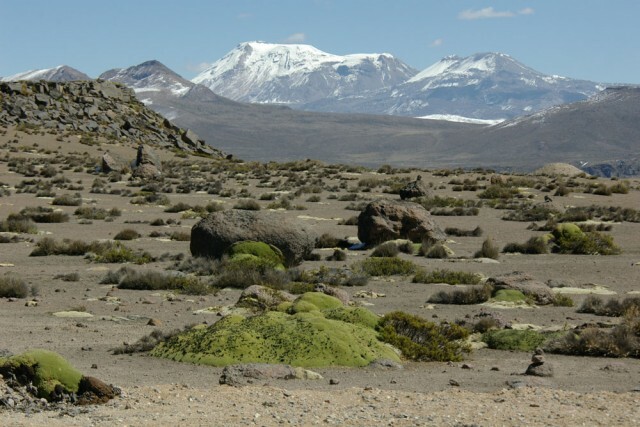 Stopped for awhile in this wonderland with commanding views over the surrounding snow-capped Andes, numerous volcanoes – most noticeably Ampatu 6,380m. 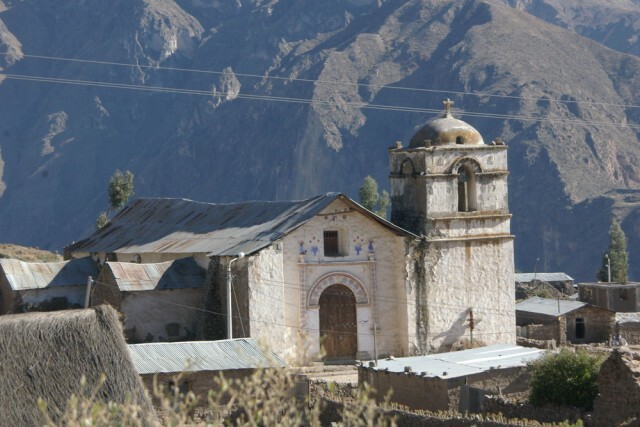 Tea-time, a short respite and then a dramatic drop off into “Valle del Colca” and the village of Chivay. Took refuge at an inexpensive very clean hotel with secure parking for our wheels – a bitterly cold night. The porter even brought us hot-water bottles not seen since ‘pa fell of the bus’. The following morning a washboard ripio road meandering along the edge of the canyon towards Cruz del Condor, ending at a mirador overlooking a deep cauldron in the canyon. The view below into the valley and the meandering river surrounded by the majestic mountains on both sides was absolutely awesome. At first glance staring yonder to a depth of 1200 m we didn’t notice anything in particular, but with a second look we realised that in fact there were folk living in the gorge at the edge of the river. Terraces and platforms with adobe houses gouged out at the base of these enormous mountains, deep down in mother earth. Incredible – if we hadn’t seen it with our own eyes we would have never believed it. Further along the valley the road follows the canyon to where it reaches its deepest depth of 3,400m. As there is no vantage point from which one can see the river at the bottom of the gorge there was no sense in driving any further, so at Cruz del Condor we turned back. We were extremely lucky to see and photograph the Condors soaring overhead. Driving to and from the mirador we passed not hundreds but thousands of walled terraced fields, starting at the edge of the river and reaching high up into the mountains. An enormous patchwork of colours – green Lucerne, veggies, yellow wheat, ploughed lands etc. right up and down the valley both sides of the Colca River. Along the road we had to stop frequently because the locals were herding their animals to and from different pastures. Absolutely terrific. The only way out of Chivay was back up from whence we came, the high Altiplano and believe me from there literally a free wheel cruise back down into Arequipa. Nearing the city the road leading into town was strewn with rocks and boulders. 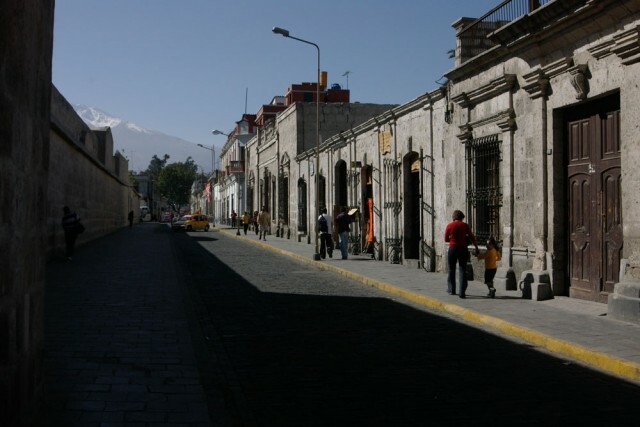 The locals had rioted the night before upset with the Government of Peru and in their vengeance, closed off all entry and exit roads not only into Arequipa but into all the major cities and towns throughout the country. Fortunately on arrival the Police, in large numbers, had managed to clear one lane and wedged between two trucks we drove into town and back to our hotel overlooking the city. Then off to our favourite restaurant run by Hari Krishna where we could savour delicious local vegetarian dishes, freshly liquidated fruit and the delectable postre (pudding). Happiness is!!!!! On our way out of Arequipa we called in at Toyota, had the Land Cruiser’s radiator drained, re-filled including anti-freeze, fitted a new cap, then followed by an oil change using a filter from my own stock of spares. Whilst draining the oil one of the mechanics discovered that the main prop shaft oil seal was seeping and recommended that it should be replaced. However, it had to be ordered from Lima and would take some days to get there. A decision was taken to go walkabout until the seal was to hand; this time westwards towards the ocean travelling via farmland and mainly dairy herds along one of the rivers that stem from high up in the Andes. Again the cattle were on the lucerne fields (feedlot) not tethered but low electric fences – excuse the pun “What a shocking way to feed?” – controlled the animals standing in a row at the edge of the greenery. With the desert both sides the scenery was almost surreal. Eventually reaching the Pacific, heavy mist hanging over the coastline, the setting dismal, as we stopped at an almost deserted derelict village, one lonesome soul in sight. There was so much devastation. We couldn’t understand why most houses were destroyed, then it struck us that an earthquake had done its job leaving turmoil all around – cracked and fallen walls, huge foundations lying bare. Absolutely frightening what nature can do, would not like to be around when it happens. Onwards we ventured north hugging the coastline – the ‘Panamericana’ tortuously clinging to huge sand dunes dropping down to the sea. On and on we went and away from overlooking the beaches of the Pacific Ocean, then a sheer drop, zigzagging and winding pass back down again. It never seemed to end. Driving via Camana we carried on and with the sun having set and in darkness entered a tiny village, Chala, took up residence in an hotel overlooking the beach on the Pacific Ocean. The lodgings weren’t bad but next morning, having had a good look at where we were, found that our abode was surrounded by ramshackle buildings and piles of rubbish on the beach. We could have been back in Africa – well not as bad but almost!! What the heck it was only a night or two with Sunday lunch at a local restaurant – unexpectedly quite delicious and very cheap. Chala, in days of yore, was a fishing port for the Incas and apparently runners taking turns similar to a steeplechase (relay race) conveyed fresh fish from Chala to Cusco, the citadel of the Inca Empire, a distance of approximately 500 kms – an amazing feat. 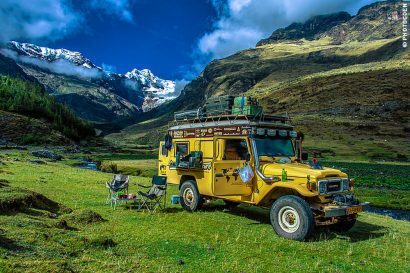 Especially when you realize Cusco is at an altitude of 3,330 m.
From Chala the road steadily rose through the arid coastal rugged and ragged mountains towards Nazca. At times the desert seemed to be so ugly – difficult to explain but if you can imagine an ugly, empty desert, you may get the gist of it. 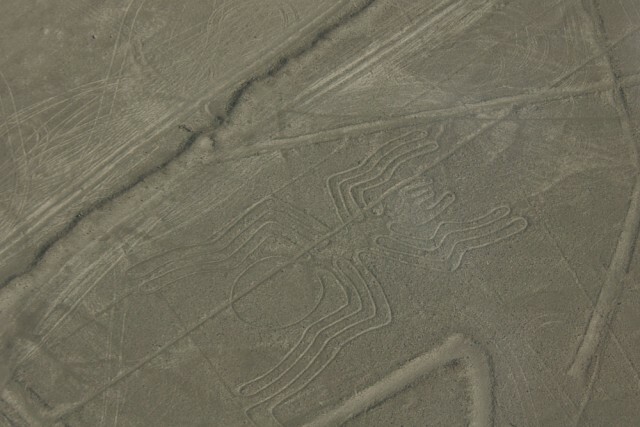 The reason for visiting Nazca which was almost totally destroyed by an earthquake in 1996 was to fly over the Nazca Lines which are huge geometrical designs drawn in the desert and most visible from the air. Apparently they were made by the simple expedient of removing the darker sun-baked stones and pebbles from the desert and piling them up on either side of the Lines, thus exposing the lighter coloured soil heavily laden with gypsum. Some of the designs represent a variety of giant animals such as an 180m long lizard, a 90m long monkey with an extravagantly curled tail and a condor with 130 m wingspan. It still remains a mystery and there is much controversy as to who constructed them and why. There are many theories but I won’t delve into them, curiosity got the better of us and took us there to see them. We checked in at Hotel La Maison Suisse (quaint name for an hotel in the desert) a small inn that liases with Aeroica a light aircraft company, which arranges flights over the ‘Lines’ for tourists. Seeing them from the air gave us a chance of taking in the size and scale of these images on the ground and an oversight of the area in which they were constructed centuries ago. 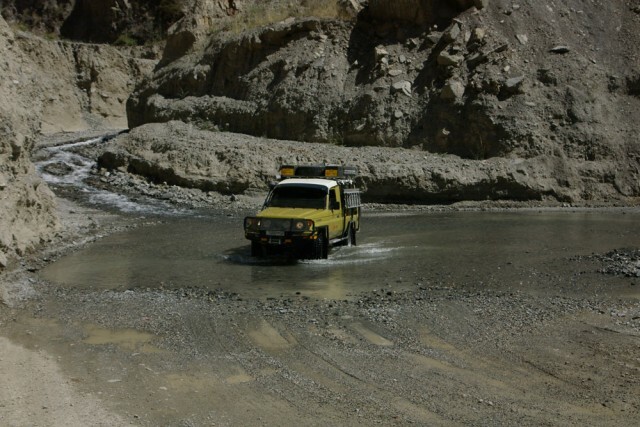 Leaving Nazca, we set off south-east to Abancay and had the unfortunate incident of running over a perro (dog). It came running out of the left-hand verge, chased the Cruiser and misjudged the vehicles speed and ran directly under the left front wheel. Fortunately it was killed outright – most regrettable but unavoidable. Dogs lie at the edge of the road and most chase passing traffic all day long. We carried on up another pass zigzagging its way up through the desert to the Altiplano. A magnificent new tarred road traversing a remote and spectacular route towards Abancay. From the late 1980’s until the latter part of the 1990’s guerrilla and bandit activity closed this route but since their leaders have been captured and committed to life imprisonment this route is open again to tourism. At the summit 4420m we descended slightly to 3960m cruising the Altiplano admiring herds of vicunas, llamas and alpacas along the way. It’s amazing to see these animals living at such high altitudes – passing lakes we sighted black and white Andean geese, duck, giant coot and even flamingos in their splendid roseate plumage then a sudden drop down into a dusty dirty village Puquio, the road (track) through it was rutted, water (not sure that it was not raw sewage) running across the passages in front of the adobe houses creating reasonably deep gulleys. So there we were bouncing our way through town and at the other end back onto the newly constructed highway and sheer heaven!! At noon the terrain levelled off into a tropical valley paralleling a crystal clear river –paw-paw, mango and banana plantations visible both sides of the river, deep down in the canyon dwarfed by the Andes either side. At dusk we climbed out of the valley up to the town of Abancay – old hotel and secure parking for our wheels. Breakfast and out of there, up, up and up a narrow street back onto the main thoroughfare of Abancay continuing the ascent out of our overnight stop. Reaching an altitude of 3960m in a distance of 30 kms averaging 40 kms an hour. Gives one an idea of the steep gradients we have to traverse. Super sunny day – passing through many villages en route – all houses and buildings constructed of adobe (mud and straw or wheat residue) mid-afternoon we reached the outskirts overlooking Cusco 3330m nestled in a bowl surrounded by the Andes. Cusco the archaeological capital of the Americas and the oldest continuously inhabited city of the Americas – massive Inca built stone walls line most of the central streets and form the foundations of virtually all colonial buildings. Cusco is steeped in history and it was the thriving centre of the Inca Empire. According to legend the city was founded in the 12th Century by the first Inca, Manco Capac, the son of the sun to become the centre of the western hemisphere’s greatest empire until 1532 when the Spaniards under Pizarro started their conquest of the Inca Empire wiping out the last Incan chief of substance Manco Inca in 1544 at Vilcabamba. Today the city is bustling with tourists, crowds and crowds of folk from all parts of the world to be seen wandering everywhere. Driving into town I made the mistake of taking a wrong turn, was stopped by a Policia-took my driver’s licence and wanted to know where we were headed. In broken Spanish we indicated we were looking for accommodation and secure parking for our camioneta (vehicle). Sitting beside me, Margaret squashed in the back, he guided us through the city waving to his mates at various intersections and eventually we found digs a little ways from the central Plaza de Armas. Still holding my license I knew what he was up to – a bribe – wasted no time once we were settled and took us for $40 and smilingly vanished into a taxi and out of sight. Freddy Chaves, I will never forget you, ha! ha! ha! Could have been worse. The actual fine for the offense was 320 nueve soles, almost $100. Not bad, my first fine having driven almost 18,000 kms and five months into our adventure. Cusco is ageless what with all the Spanish colonial buildings, cathedral and church surrounding the central plaza, cobbled streets abound. Margaret and I spent hours and hours wandering the streets marvelling the architecture of days gone by. Also found an inexpensive restaurant serving delicious meals. All in all a most relaxing respite before our next adventure, a trip to Parque Nacional Manu in the jungle of the Amazon headwaters. Stay tuned for more adventures with Tubby Xplorer.